A leader in service and maintenance of perimeter security and access control installations, HTS Group, is expanding its operations in New Zealand to supply world leading anti-terrorism solutions to protect the public from possible attacks. Ranging from simple barrier and boom gates for carparks, right through to advanced speed gates with integrated controls, HTS Group’s technologies are designed to protect spaces from unauthorised personnel that may intend to cause harm. The latest technologies include independently tested crash-rated bollards, gates and speed stiles, designed to protect people from threats inside buildings and out in the open. HTS Group is expanding its New Zealand operations through its offices in Auckland and Wellington. “Globally, there has been an increase in violent and disruptive incidents caused by disaffected people wanting to cause harm to others. While New Zealand is sheltered from these sorts of attacks to a degree, they are not totally immune. Facility managers, therefore, have a duty of care to protect people in their buildings by taking preventative measures,” says Mr Noel Maharaj, Managing Director, HTS Group Ltd, which has been supplying and servicing installations in New Zealand with access and security technologies for more than 20 years, and is seeing an increase in demand for higher security technologies in response to global trends. “Enquiries for safety and security technologies have trebled worldwide in recent years, as companies and organisations are becoming more aware of security risks evident globally, and how to mitigate against them,” he said. Facilities to which the HTS Group’s technologies provide security and safety benefits particularly include tourist hotspots, corporate headquarters, government buildings, public infrastructure spaces, stadiums, correctional facilities, energy and fuel, retail, construction sites and healthcare facilities. In addition to technologies to keep buildings and facilities secure, HTS Group also provides a range of anti-terror and open spaces security technologies, to prevent outdoor incidents. The company has partnered with suppliers such as Ezi Security Systems, Magnetic Automation and Boon Edam, with a shared focus on safety and reliability. “New Zealand will be hosting the Americas Cup and APEC conference in 2021, so forward-thinking infrastructure and security planners thinking about public safety measures should be looking at independently crash-rated products,” says Mr Maharaj. The IWA 14-1:2013 is the recognised international standard which specifies the essential impact performance requirement for a vehicle security barrier (VSB) and a test method for rating its performance when subjected to a single impact by a test vehicle not driven by a human being. 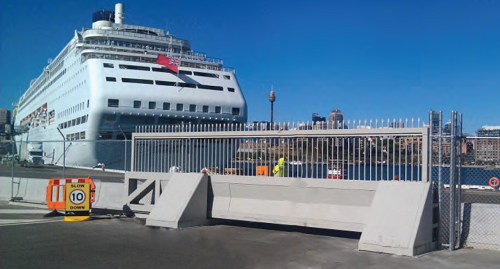 HTS Group is an authorised distributor and service agent for the Safetyflex anti-terrorist bollards, barriers and crash fences, including the smallest and most cost-effective 50MPH (80Km/hr) bollards system available, requiring only a 200mm deep foundation. “People wanting to cause maximum harm often choose large open spaces, or well-known landmarks. The simple act of installing barriers or bollards that mean vehicles are unable to enter a large open space could save lives,” says Mr Maharaj. 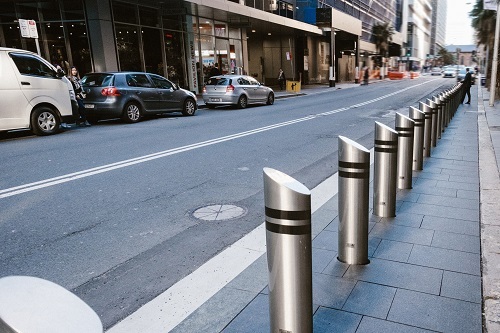 HTS Group’s bollards can withstand impacts from vehicles weighing up to 7.2 tonnes at 80kph, which safely prevents vehicular terror threats from entering public spaces where they can cause harm to large numbers of people. In addition to providing an extensive range of access and security technologies, HTS Group has in-house problem solving and technical expertise to create unique solutions for challenging applications. “We don’t see unusual or challenging situations as problems – we see them as an opportunity to provide a unique solution that will provide ongoing benefits. Our team has the knowledge and experience to be far more than providers of quality products,” says Mr Maharaj. “Every facility is different, both in its physical construction, and the way it is used. A one-size-fits all approach just won’t work when it comes to security and access control. Instead, we look at each project comprehensively before recommending the appropriate solution,” he said. HTS Group further extends its security and access control reach through partnerships with organisations that share a focus on quality and safety. HTS Group also places a strong emphasis on quality, and is BVQI, ISO 9001:2008, and AS/NZS 4801:2001 – occupational safety and health accredited. “Our partnerships allow us to extend our ranges even further into complementary areas by working with world-class companies such as Ezi Security Systems, Magnetic Automation and Boon Edam. It allows us to provide complete security solutions, because we can provide a large range of products and services from a single point,” says Mr Maharaj. “The security industry is rapidly changing, both in response to global threats, and in a pre-emptive nature, to safeguard against new threats that haven’t yet been realised. We’re seeing a strong trend towards advanced technologies such as facial recognition, which can often be easily integrated into existing access technologies,” says Mr Maharaj. HTS Group also has strong expertise in traffic management systems, vehicle technology, sports timing and digital media signage. HTS Group Ltd provides a complete design, system integration, installation and maintenance package to the transportation, traffic engineering, parking and sports timing industries in New Zealand, Australia and the Pacific Islands. HTS Group staff have been directly involved in significant projects for the past 25 years. Our customers are key, and it is our aim to exceed their expectations through technical excellence. HTS Group provides a professional, flexible, quality and best value focused service.